In a wide variety of public spaces – from interstates to Apple stores to student unions – we are witnessing forcible disruptions of everyday life. All the die-ins and stoppages on the interstate and #hashtagging is about justice. The movement presupposes, though, that everyone knows what justice looks like, that we see it the same way, and that we all note its absence. In the age of The Expendables, I’m not sure this is true for everyone. In fact, I think one reason so many people are silent right now – a disbelieving silence, perhaps, but also a gleeful silence for a few others – is that some of our current notions of justice don’t come from a reading of philosophy or a study of the history of the human rights era: they come from the national popular. I’m talking about action movies, people. The justice we need doesn’t exist; the justice we have – muscular, lawless, violent – is everywhere. This leaves us all in a bind. On a weekly basis – and apparently without much cognitive dissonance – we all receive terrible news about a vast crisis in American life. Some of us struggle to keep friends and family alive. And others, quite simply, don’t. And then, amazingly, for those of us who head to theatre or queue up something on the screen, there is suddenly justice all over the place, usually delivered by outsized heroes (usually but not exclusively white men) with steely gazes and oversized guns and phallic knives. With barely a moment’s thought for legal procedures, community relations, and best policing practices, these avatars of unrestrained masculinity blow things up, knock heads, and lay waste to their enemies. And then the news cycle begins again. As I’ve moved through this terrible fall, I’ve struggled to bridge the gap between the abundance of a certain kind of justice on the silver screen and its pitiful absence everywhere else. One of the purest, oldest expressions of American popular culture, I know, is the disposable, cheap-thrills of the blockbuster action movie. These movies are so ubiquitous and so ordinary, that they rarely get talked about critically. Almost everyone has seen one of these movies, and stock characters and one-liners – from Rambo to “Make my day, punk!” – litter the political lexicon. Still, for this very reason, they are also important indicators of the American male id. They fall outside of our critical scrutiny. They are raw truths. The long history of this genre dates back to Cold War westerns, where a plotline of “Cowboys versus Indians” often matched up nicely to the ambitions of American foreign policy. The real take-off point for action movies, though, came in the wake of the Civil Rights Movement, as race riots and the war in Vietnam eroded popular faith in liberalism – and especially in liberal policing of the American cityscape. Dirty Harry (1971) and Death Wish (1974) aren’t just celebrations of vigilante heroes, they’re also meditations on liberalism’s softness, its presumably cautious political correctness, its all-too-gentle approach to criminals and crime. These movies, and others like them, emphasize the breakdown of civil society, and stress the need for more muscular responses – responses that often fell outside of the law. From that point, it is only a hop-skip-and-a-jump to the muscle-bound star-vehicles of the 1980s and 1990s, with their hard bodies and their massive weaponry, and their general lack of concern for legal process and the court system. I led a class on these movies this semester, and, at every twist and turn through the genealogy, we were haunted by the contemporary storylines in the press. What we learned – covering everything from The Searchers (1956) through The Expendables (2010) – is chilling. The guns get bigger, and the scale of death and destruction expands. Charles Bronson has a small six-shooter in Death Wish. He kills a handful of “bad guys.” In 2008’s Rambo, titular character uses a mini-gun mounted on the back of army truck to dismember hundreds of brown-skinned villains. By the time we get to the Expendables, the six-shooter has become a nostalgic referent of “the good old days”; the lead character, Barney Ross played by Sylvester Stallone, carries one on his hip, though he often dispenses with it when he needs a little more machismo. Many have noted the deployment of military technology in local policing, but few have noticed how well-armed our fictional saviors have become. One doesn’t have to be a moralist, worrying over the impact of violence on viewers, to recognize that we expect these movies to deliver justice – and body counts – in heavy volume. And to wonder what the political meaning is here. How long does it take, really, to walk from Falling Down (1993) to Darren Wilson? Not long, I think. The most important takeaway, though, is the one that concerns me the most: in nearly all of these movies, the criminal justice system is simply incapable of administering appropriate punishment. 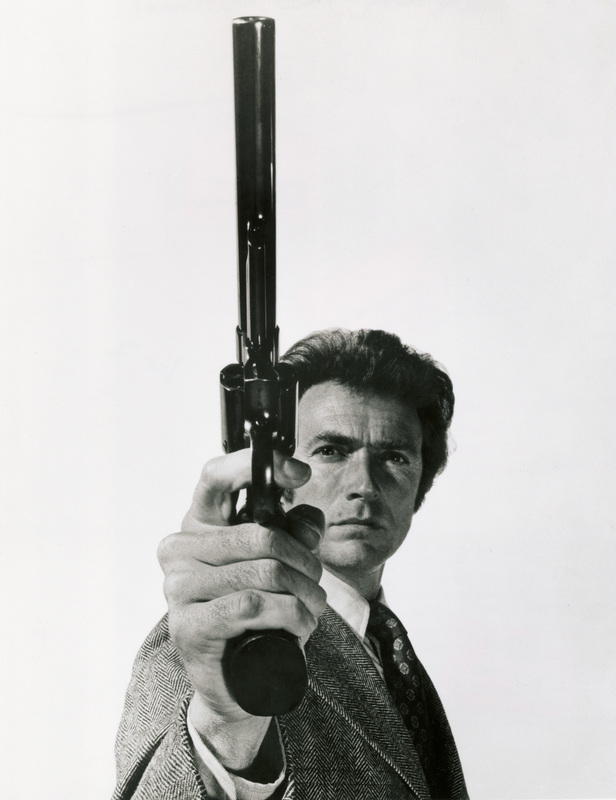 Dirty Harry was just the beginning, it seems. The hero – usually lone, white, and male, though sometimes with a “buddy” or an accompanying “platoon” – wanders a landscape where the police are incompetent, weak, or generally absent. He delivers justice without regard for laws, using ever-larger weapons, and wherever and whenever it is needed, from the city streets to the dense canopy of the jungle to the dry and dusty borderlands. Indeed, in many of these films, one finds an explicit denunciation of the law, and an invocation of justice as its exact opposite. I shouldn’t have to highlight how surreal this seems. This image of the pathetic civilian authorities, either entirely absent or extinguished quickly to make room for the “real” hero, stands in jarring contrast to what we see these days on the news: local police who look like military soldiers, equipped with body armor and automatic rifles and driving tanks. There are, of course, departures from the whiteness and maleness of the genre, ranging from Shaft (1971) to Sucker Punch (2011), but these departures emphasize the ways in which women and people of color are just struggling to survive. The narratives in this minor subgenre might challenge patriarchy and racism, but only affectively or symbolically. Not structurally. They leave the world, in the end, as they find it. Sweet Pea, at the end of Sucker Punch, is lobotomized and institutionalized. And John Shaft calls the police. What does it mean that the physical embodiment of justice in American popular culture isn’t the cop but the action hero? What does it mean when justice isn’t enabled by a body of men and women accountable to civilian authorities, but by rogue sociopaths like Lee Child’s Jack Reacher, the former MP who wanders around the country breaking heads and bodies, or Stallone’s John Rambo, released into the wild by his military handlers when conventional tactics and the rules of engagement have failed? It means, perhaps, that our popular notions of justice are deeply, disturbingly disconnected from the law. It means that we imagine that justice comes from lawlessness, and not from a judge, or a trio of lawyers, or a constitutional scholar. It arrives with an epic beat-down, and not with a genteel summons to court. And it results, almost invariably, in a messy, bloody death. It makes it possible for some people to see an armed response to a threat as the kind of justice that deserves applause. Whether we admit it or not, we have an insatiable appetite for justice freed from legal restraint, and administered by the white male hero. So, then, in addition to the eloquent staging of die-ins and the enactment of major policy reforms, we should also be thinking about other things, too. Like whether we need to reimagine our sense of justice, defining it clearly and compassionately, so that we don’t, in one moment, righteously castigate the officer who uses an illegal chokehold to end a man’s life and then, without recognizing the irony, celebrate those idealized white male bodies on the silver screen who so spectacularly transgress what is deemed, in the day-to-day life of everyone, to be proper and legal and necessary. We need, in the end, to not merely understand how the national popular reinforces – and is, in turn, reinforced by – what is happening on our streetscapes. We may also need to break or remake the connection permanently. Of course, this assumes that deep inside, where we keep our secret selves, we all actually want to change anything.That we don’t want the world of 2012’s Judge Dredd, where armor clad officials act as unquestioned judge, jury, and executioner in a dystopia peopled by the very poor and desperate. With the rich safely offscreen. We’re a lot closer to that world than we want to admit.